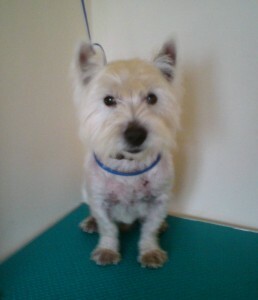 This is the story of Tommy, a young male Westie taken in by Westie Rescue before Christmas in 2009. This is how his story started in the Homes Needed section, but I’ve removed it to here as a tribute to this little dog who wormed his way into a few hearts during his short stay with Westie Rescue and his foster family. 18th Dec 2009: This poor fella is Tommy. 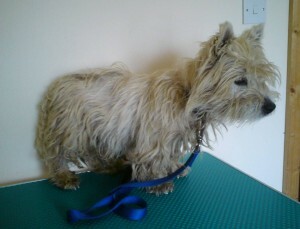 Tommy was found wandering in Wicklow, and was handed into Westie Rescue in the past week (Dec 2009). As you can see, poor Tommy had seen better days when he came into rescue, he looked like a dog well above his youthful years: Tommy is only about 3! Needless to say, we made it a priority to get Tommy cleaned up immediately so that he would feel more comfortable. He really enjoyed being clipped and groomed, he was so well behaved and mannerly. However, once he was cleaned up some problems revealed themselves. Tommy had a full vet check today (18th Dec 2009) and we fear that he has some health problems that could be extremely serious. However, we won’t know for sure until the results come in after Christmas what Tommy’s future will be. We’re not terribly hopeful that his results will be positive, but we won’t give up on him until we know for sure! He’s such a good-natured, patient young man, we’ll do everything we can for him. It breaks my heart that Tommy hasn’t a warm hearth to call his own over Christmas. So, I’m looking for a very special and caring person to foster Tommy for the couple of weeks over Christmas so that he can enjoy the comforts of a loving home in the festive season! He’s had a rough time in the past while and he deserves the very best now. Tommy is quite sociable with other dogs and loves nothing more than being scratched along the back and having a warm spot to sit on. His sight and hearing aren’t perfect but he’s not too bad either, and he can have accidents inside, but he’s a young dog and is already picking it up after only a couple of days. He loves travelling in the car. Please note, none of Tommy’s ailments are transmissible to other dogs, so don’t let this put you off if you already have another dog! Do you think you can help this delightful young man? He’s looking for a reasonably quiet and calm foster home, just for a couple of weeks so that he can enjoy a toasty warm Christmas where somebody will give him the hugs and attention he adores. We don’t know how he is with children, I don’t feel he’d cause a problem as he’s a friendly fellow, however it would be best if there aren’t kids living full-time in the foster home. If you’ve been thinking about spreading some Christmas cheer in the doggy world, and think you could offer Tommy what we’re looking for, please don’t hesitate to give me a shout! Westie rescue will cover all his feeding and other costs whilst in foster care. If you can help, call Maureen at 086 8200010. I’m afraid I have some bad news to report. Poor Tommy died yesterday, Monday 11th January 2010. He was a very sick little dog: his time came yesterday and he slipped away without any more pain. I’d like to take this opportunity to thank his wonderful, kind fosterer, Maria from Omagh and her family, who gave Tommy a lovely, happy, warm Christmas.. he got to eat all sorts of lovely goodies and curl up on whatever warm surface that took his fancy! What a lucky little fella! Tommy had a bad time of it for the few months before Christmas until he came to Westie Rescue, and we felt it was important that his last few weeks would be fun, warm, and in the middle of a family who loved him as he should have been loved all his short life. Tommy was a young dog with a lot of illnesses that he shouldn’t have had. Again, he is an example of how this breed are paying the price for the greed and selfishness of back yard breeders and puppy farmers who neither know nor care about the welfare of the pups they breed once they’ve got their money. Tommy died of cancer, at 3 years of age, complicated by Cushing’s Disease. It’s an absolute disgrace. Don’t let his death be in vain: don’t go the fast-track route to buying a Westie. Make sure you do your research and get a healthy, well-bred pup from a reputable breeder. Good luck Tommy, you were a great little trooper!